Net migration from outside the EU has hit the highest level in nearly 15 years, as a post-Brexit plunge in arrivals from the bloc continued, new figures reveal. 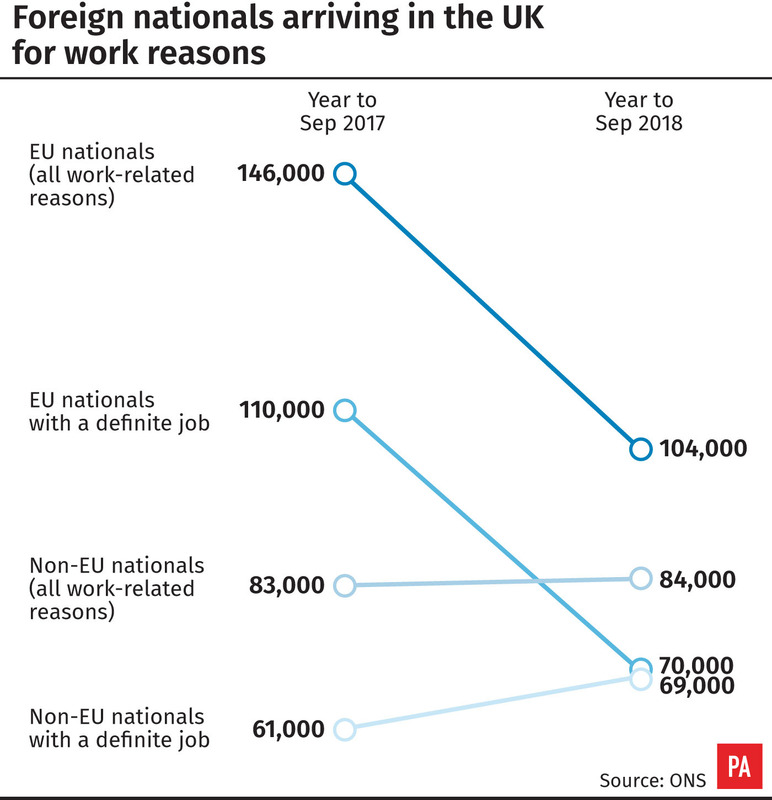 Overall, the balance between the numbers arriving in and leaving the UK remained above 250,000 – nearly three times the Government’s target level of below 100,000. Office for National Statistics data showed that 261,000 more non-EU citizens came to the country than left in the year ending September 2018. This was the highest estimate since 2004. EU net migration continued to add to the UK’s population but it almost halved year-on-year to 57,000 – a level last seen in 2009. Overall, around 283,000 more people moved to the UK with an intention to stay 12 months or more than left. The figures showed that, in the year to September, 627,000 people moved to the UK, while 345,000 emigrated. The ONS analysis suggests net migration, immigration and emigration figures have remained broadly stable since the end of 2016. Net migration from eight eastern European states that joined the EU in 2004 has been negative in the last three quarterly statistical bulletins. In the last period, 15,000 more nationals from the so-called EU8 states – Czech Republic, Estonia, Hungary, Latvia, Lithuania, Poland, Slovakia and Slovenia – departed than arrived. This recent pattern differs to those from other EU countries, where statisticians said they have continued to see more people arriving than leaving. The outflow of EU nationals has jumped sharply since the referendum, standing at an estimated 145,000 in the latest period. Meanwhile, there has been a gradual increase in immigration of non-EU citizens over the past five years for both work and study. Year-on-year, net migration from Asia went up by around 40,000 to 185,000, including 28,000 from south-east Asia – almost double the level 12 months earlier. Both of these were “statistically significant” increases. Madeleine Sumption, director of the Migration Observatory at the University of Oxford, said: “The overall story the data tell on EU migration is clear – Britain is not as attractive to EU migrants as it was a couple of years ago. Shadow home secretary Diane Abbott said: “The data simply confirms the fakery behind the Government’s immigration policy. The figures are the first official migration statistics published since the Government revealed proposals for the post-Brexit immigration system in December. Under the plans, a new route will be created for migrants at any skill level to come to the UK temporarily, the annual cap on skilled work visas will be scrapped and employers wanting to sponsor overseas employees will no longer be required to carry out a “resident labour market test”. Immigration Minister Caroline Nokes said: “The UK is continuing to attract and retain highly skilled workers, including more doctors and nurses, while talented international students are benefiting from our world leading universities and boosting our economy. “However, we are committed to controlled and sustainable migration. “As we leave the EU, our new immigration system will give us full control over who comes here for the first time in decades, while enabling employers to have access to the skills they need from around the world. Prime Minister Theresa May’s official spokesman said the increase in non-EU immigrants was driven in part by the need to recruit NHS staff. “There was a decision taken last year to address particular concerns around the health service to allow in more skilled doctors and nurses, and you obviously can see aspects of that in the figures published today,” he said. The spokesman confirmed that Mrs May remained committed to reducing annual net migration to the tens of thousands, but said the PM had always been clear that it would “take time” to achieve this goal.